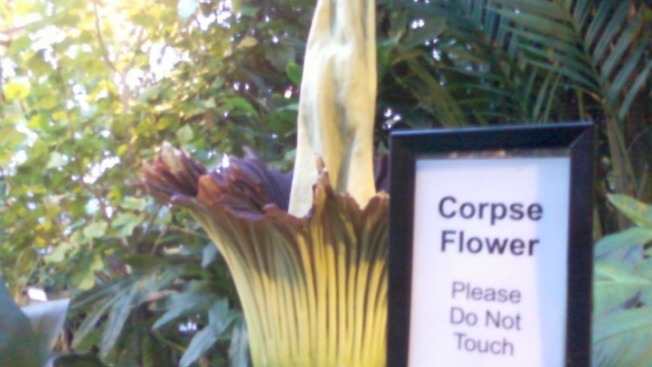 The long wait is finally over for visitors who have been yearning for a whiff of a giant flower that smells oddly like rotting flesh. Titan arum -- a giant rainforest plant that has been dubbed the "corpse flower" for its terrible smell -- finally began to bloom around 6 p.m. Sunday at the U.S. Botanic Garden, next to the Capitol. Experts had been anticipating its bloom for more than a week and extended the garden's hours for visitors each night. "We did not expect it would move quickly," said Bill McLaughlin, curator of plants at the Botanic Garden. He described the stench as akin to that of dead animal flesh. "By about 7:30 at night, the whole room was filled with it. 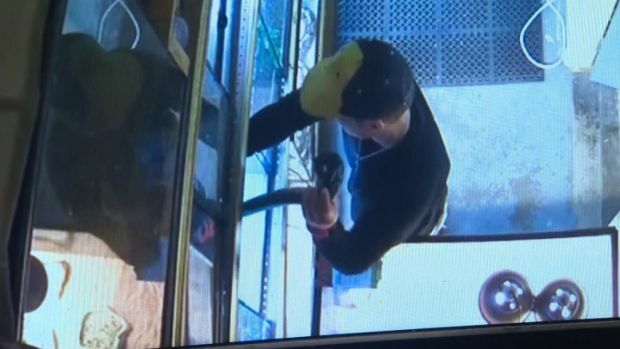 It was a rather sickening odor," he said. "Not really something you'd want around dinner time." Garden officials expect the flower to remain open for an estimated 24 to 48 hours before collapsing on itself -- but it seems "peak smell" has already passed. The corpse flower loses it odor 10 to 12 hours after blooming. By noon Monday, some tourists told NBC News they were disappointed that the odor had subsided. The last corpse flower to bloom at the U.S. Botanic Garden did so in 2007. The titan arum is native to the tropical rainforests of Sumatra, Indonesia. It was first discovered in 1878. Corpse flowers also have recently bloomed at facilities in Ohio and in Belgium. Scientists say the flower's strange odor serves to attract beetles or other insects that are normally drawn to rotting flesh. "Just in the same way that a lovely smelling plant, like a rose, is attracting a bee or another kind of insect with what we would consider a very nice smell, to pollinate it, this particular plant has the strategy of using a horrible, fetid smell to attract insects," said Ari Novy, the public programs manager at the garden. "So this plant is essentially tricking those kinds of insects into coming, having a party inside of the plant and the flower and pollinating it and then moving on," Novy said. The titan arum growing at the U.S. Botanic Garden is about 10 years old, and this is its first flower. It began with a seed the size of a lima bean and has grown several feet tall. The plants bloom on irregular, unpredictable schedules, Novy said. A hot, humid climate provides the ideal conditions for the plant to produce a flower. Besides drawing beetles, the titan arum has proven to be a big draw for visitors.